MP PPT 2019: Madhya Pradesh Pre-Polytechnic Test (MP PPT) is a state level entrance exam conducted by Madhya Pradesh Professional Exam Board (MPPEB) or Madhya Pradesh Vyapam every year. MP PPT is organized this year also for eligible and interested students for Polytechnic course. Latest Update: MP PPT 2019 Exam Date has been released. It will be held on 7th April 2019. Through MP PPT Exam applicants can get admission in various governments or private polytechnic institutes across the Madhya Pradesh state. Madhya Pradesh vyapam conducts this exam online probably in last week of April or first week of May. Only eligible candidates can appear for MP PPT 2019 Examination. So must check the eligibility criteria for MP PPT before filling the MP PPT Application Form 2019. Applicant appearing for MP PPT should have domicile of Madhya Pradesh. Candidate must have passed 10th /equivalent examination from recognized board. Must score at least 50% marks in the qualifying exam. MPPEB or Madhya Pradesh vyapam will announce the dates related to MP PPT exam. You can check the schedules of filling of application form, correction of the Application Form, MP PPT Exam Date and result declaration here. These are not actual dates. It may change after the official announcement from the authority of MPPEB. The authority of MPPEB or MP vyapam will announce the starting date of filling the MP PPT Application form. Interested candidates can apply for the MP PPT 2019 Application form. It will be available online. Application fees are categorized. The fee can be paid through online mode only. You can correct the details if entered wrong while filling the application form.MP vyapam will announce the correction date for application form before the last date of submission of MP PPT online application form. Fill the application form on or before the last date. Fill the personal details and upload the passport sized scanned photograph. Submit the form and pay the MP PPT Application Fee through online payment. 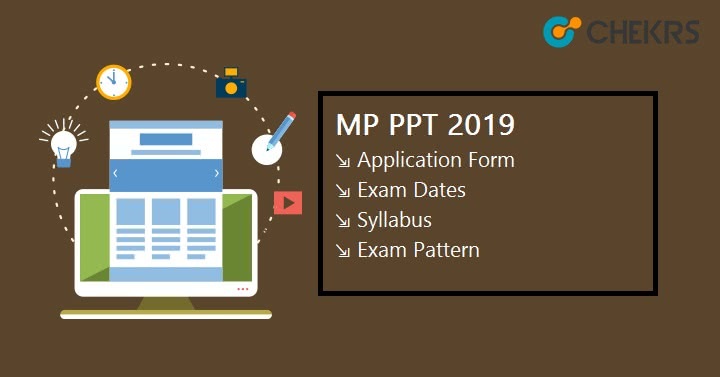 Before appearing in the exam, candidates should know about the exam pattern of MP PPT 2019. Exam Pattern will help you in examination preparation. MP PPT Exam Pattern will provide you information like the number of question asked in the exam, level of paper, mode of paper, total marks, time duration etc. You can check the MP PPT 2019 Exam Pattern. The exam will be held in online mode only. The question will be asked in both English and Hindi languages. There will be total 150 multiple choice questions. Each question carries equal marks. For each correct answer, 1 mark will be allotted. 2 hrs will be provided to complete the paper. MP PPT Syllabus comprises of Physics, Chemistry, and Mathematics of 10th class. Go through the whole syllabus of class 10 to score well in MP Polytechnic exam. Questions will be asked from the contents covered in Physics, Chemistry, and Mathematics. You can download the entire syllabus from the official portal. MP PPT Syllabus contains topic like Algebra, Trigonometry, Speed, Chemical bond etc. The Exam will be conducted in the month of May 2019. Students appearing for this exam can check the previous year question paper of MP PPT Examination. MP PPT Previous Year Sample Paper will help you to achieve good marks and rank in the polytechnic exam of Madhya Pradesh, state. Click on the link to download sample paper with their solutions. Make a timetable. Divide your time for everything accordingly. Don’t try to attempt the lengthy question. Always solve easy question first and later attempt difficult one. Make short notes and go through it. Take help of books other than NCERT. The authority of Madhya Pradesh Professional Exam Board, MP will issue the MP PPT Admit card probably in the month of April. MP PPT 2019 Hall ticket will available online. Candidates can download their admit card from the official website of MP vyapam. Please check the process to download the admit card. Click on the link to download the admit card. Enter the required details to download the admit card or MP PPT Hall Ticket. Take the print out of hall ticket. Must carry MP PPT admit card while appearing for MP PPT Exam with a valid Id proof. Answer key will be published online by the authority of MPPEB on the official website. MP PPT Answer key releases within 5 or 10 days after successfully conducting the exams. Candidates can download the MP PPT Answer Key and can compare with theirs. On the basis of answer key of MP PPT, applicants can evaluate their marks. Cut-off marks are minimum marks required to take admission in government or top private colleges. Those who clear the MP PPT 2019 cut-off marks will get admission in polytechnic colleges of Madhya Pradesh. Every year, thousands of applicants applied for MP PPT exam, only a few get selected on the basis of their score and merit list.MP vyapam authority decides the cut-off and publishes online. Admission process starts after releasing of cut-off. MP PPT Cut-off marks vary every year. MP PPT result will be declared in the month of June/July. Result dates are not confirmed yet so we will update you after the actual announcement of result date. MPPEB authority will publish the MP PPT 2019 scorecard on their website. Candidates have to visit the portal of MPPPEB to check their result. After result declaration, applicants will know their score, rank, qualifying status. On the basis of the scorecard, applicants can get admission in polytechnic colleges of Madhya Pradesh for the diploma in various polytechnic courses.